What are the M bloggers saying about Michigan's win over Cincinnati? A little late posting this because...real life. 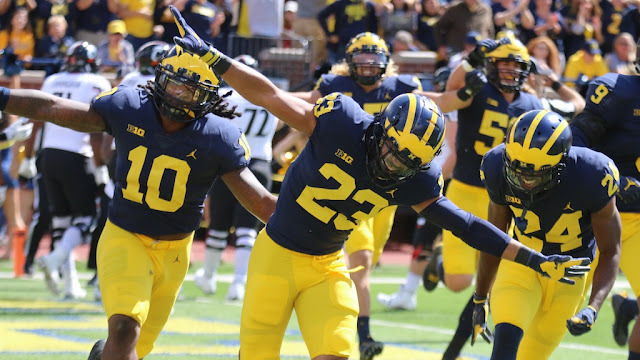 The Michigan bloggers have taken to their keyboards once again to break down what we saw, how we felt, and more importantly, what it all means. Here's what we're reading today. UNIFORM CHAMPION – I can’t tell you how cool it was to (once again) see the wolverine decals on the Michigan helmets! As I said last week, as long as Jim Harbaugh is the Michigan football coach, there will be helmet stickers on the Wolverine headgear. Now, from what I can tell, it does indeed appear that the blue outline has been removed and it also seems as though the stickers may be that much smaller in size. Probably a wise move, as making them smaller will allow for more to be placed on the Michigan helmets. I’ll see if I can track down one and provide a more detailed analysis later in the season. Michigan's home opener was supposed to look a lot like last year's Rutgers game. Instead, it more closely resembled last week's Florida game. While that was perfectly fine against a talented UF squad, it was far less so against an overmatched Cincinnati team that barely squeaked by Austin Peay last week. 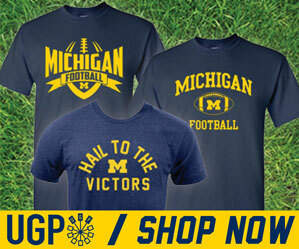 If we aren't already at the tipping point where "Wilton Speight makes a lot of critical mistakes" is a reasonable, seemingly immutable theory, surely we are approaching it. The weird thing is the way these critical mistakes are loosed into the world. Anybody can throw several passes into defenders' facemasks. Killing your team with a blizzard of boggling interceptions is almost common in college football, where injuries and the vagaries of rostering regularly see peach-fuzzed high schoolers thrown into a tank of piranhas. Sometimes people transfer from Tulane and are expected to stop throwing interceptions, for reasons unknown. Also apparently the NFL has this issue. Twitter informs me Scott Tolzien—yes, that guy—started a game this weekend. Twitter hastens to note that things did not go well. The hopelessly overmatched panic machine quarterback is so common it's a football trope. So this was a weird day. I spent most of the morning, into the afternoon (and kickoff) at my father-in-law's farm retirement auction. He had this planned for the last three years, so my only real hope of seeing today's game live was a 3:30 kickoff. No luck. It was the rare time I was cheering for a 3:30, but in what I saw on my phone, and later, on television indicated to me that I really didn't miss much. I've said here before that the distance between "survived upset bid" and "lost at home while favored by 30+ points" is a chasm visible from space. Today was a great pair of opening and final quarters, sandwiched around a less than delicious filling. Yet, Michigan won by 22, so you know, we're back to being Michigan again. Pre-game odds showed a point spread of 34.5 points. Consider what a win over the Wolverines would have done for Luke’s career, team, etc. Although it is painful, just recall Appalachian State of eleven years ago to recall the horror of such a loss. The Wolverines did not let that happen. While we might not like the Wolverine’s style in this game as much as in the Florida game preceding, the young team got a another hat full of experience. The Michigan offense was mistake prone and lackluster most of the day, unable to string together consistent drives against a defense that ranked 72nd nationally a year ago. Sure, the Bearcats’ defense was full of returning starters and now coached by a defensive-minded head coach in Luke Fickell, but there’s no reasons a Michigan offense shouldn’t have more success moving the ball. Take away the two defensive touchdowns and the Wolverines managed just 22 points.